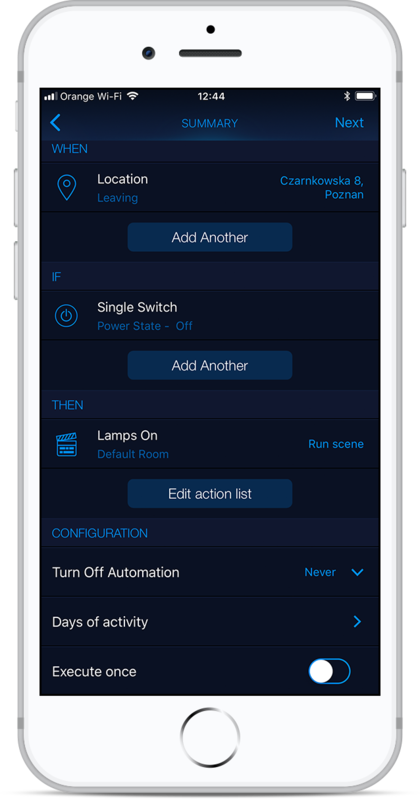 HomeKit allows to create scenes and automations to free the potential of a smart home. However, to run automations, a home hub is necessary. Go to official Apple Support page to learn what is a home hub and how to set one up in your home. Automations perform specific actions triggered by a specified device or sensor if the set conditions are met. Timer Automation is a simple automation based on time events. For example, an automation can trigger your fan that is connected to your wall plug to turn on automatically at a specific time. Scene, on the other hand, is simply a group of devices and their parameters set in a given configuration. They can be activated manually, using Siri, or via the automation. 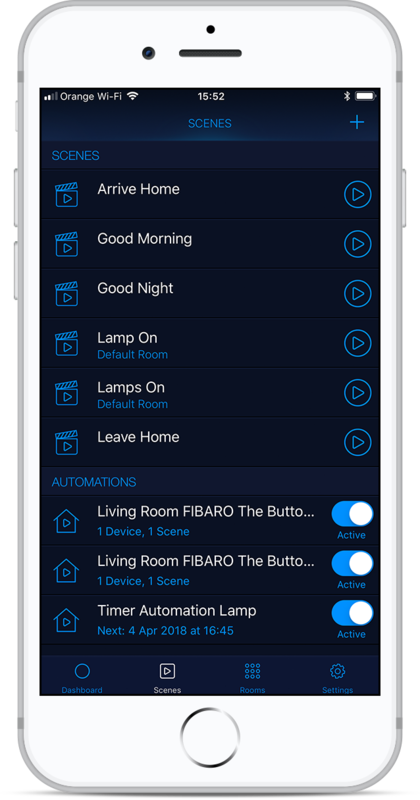 The FIBARO for HomeKit Devices app makes possible to make even more advanced automations. Automations can automatically perform previously set actions when a condition is met under certain circumstances. This short explanatory article will guide you through the available options in our app. It’s an older and simpler method of creating automations based on time events. In the upper part of the screen you can see two actions: if, then. Both these actions must be set during the process. When you select Once, you will be able to set the start time and date for when it should be executed. Tapping Start at will show the time picker. 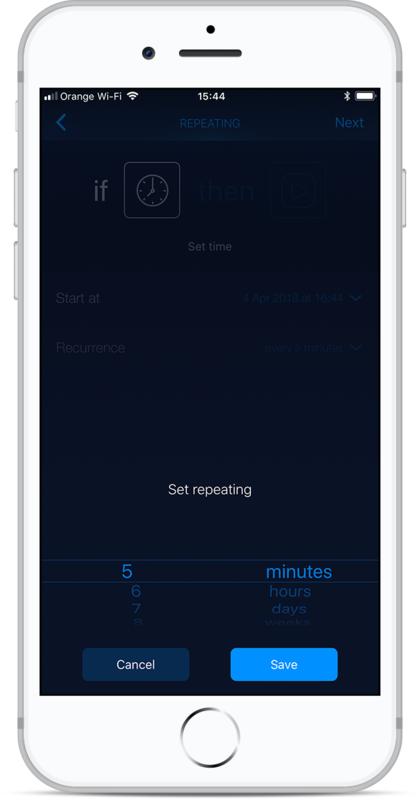 When you select Repeating, you will be able to set the start time and date and the interval. The shortest period of time you can set is 5 minutes, and the longest is 5 weeks. Tapping Start at will show the date picker, and Recurrence will show the available intervals. create new scenes – tapping Create New Scene will take you to the list of available devices. You can set actions on devices which will be included in this scene. choose already made scenes – Tap names of the scenes you want to run at the time you set in a previous step and tap Next to continue. In the automation summary you can test the automation by tapping Test Automation. From the summary view you can also go back and edit particular sections, WHEN or THEN. To go back to editing tap Edit action list. Your newly created automation will be added to the AUTOMATIONS list. You can activate and deactivate automations with a toggle button on that list. Automation is a set of actions (THEN) which are executed when they are triggered by devices set in the first step (WHEN), under the conditions set in the second step (IF). When is a condition which must be met to trigger the automation. User can choose only one device per automation in this step. There are 5 types of triggers. This option allows users to decide whether the action should be triggered automatically when you leave the specified place (Leaving) or when you arrive at the chosen place (Arriving). 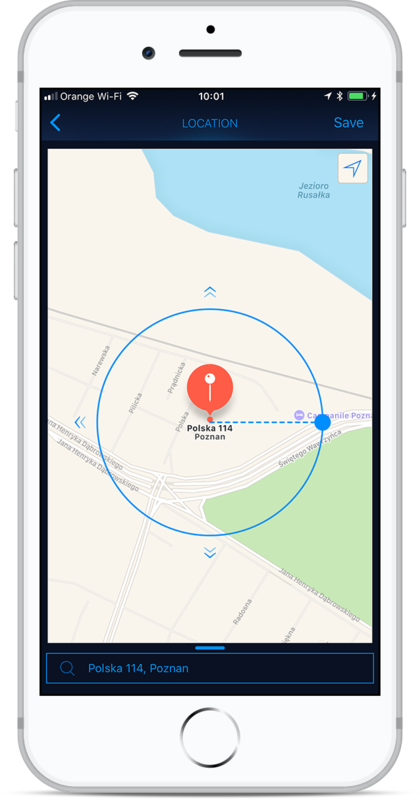 After tapping Add location, it is possible to indicate the area. By dragging the blue dot you can resize the circle diameter which triggers the action. 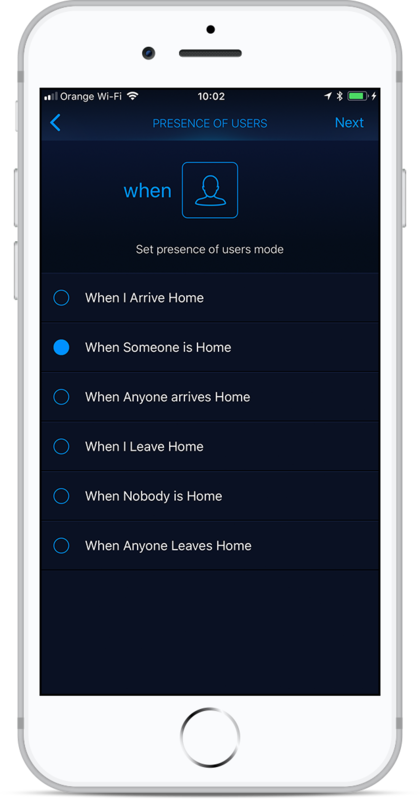 This option allows users to decide whether certain actions should be executed when certain users are present or absent at home. Setting the option When someone is Home will allow to execute the automation when at least one user is at home, for example, the lights will stay on in the living room. This option allows users to decide whether the automation should start at a certain time of the day (Sunrise/Sunset) or time (Time of Day). You can adjust those options, and you can make it even more dynamic. You can set an offset on Sunrise and Sunset. This option allows users to decide which device should trigger the automation and which parameter exactly has to change for the automation to start. 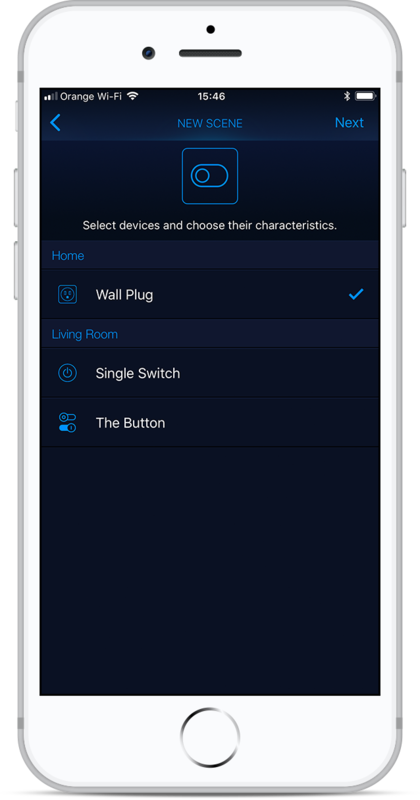 For example, you can choose Wall Plug, and specify its Power State by tapping the toggle. This option allows users to decide which sensor and its parameter should trigger the automation. For example, you can set Flood Sensor which detects Leak detection to be a trigger for the automation. In the second step, users can set an additional conditions which will influence the triggering mechanisms. It doesn’t have to be set, it is completely optional. You can tap Next to skip this step. However, when you decide to add those conditions, you can choose from the following options described above: Time of Day, Presence of Users, Devices, Sensors. Since those conditions are optional, some settings may be unavailable because they could affect each other, for example, you cannot choose another Location because you can leave or arrive only at one place at the time. It is possible to set more than just one IF condition. It is impossible with the first step (WHEN) which acts as a trigger, but in this case, you are allowed to set more than one condition. In the third step, users are able to set which scenes will be executed when the given conditions are met. If you don’t have any scenes, you will be able to create a new scene within the process of creating the automation. In the summary, you will be able to test or change your automation. Tapping Test Automation performs a test of the automation. Tapping Add Another or Edit action list allows to modify certain parameters. Now, when you know the mechanisms, it’s time to set up some automations on your own. You can use the examples listed below. They will guide you at every step.